We have educational books, activity books, thinking games, CDs, DVDs, toys and much more! At PERC, there is something for every age. There are many subjects that may spark your interest. This blog will include MONTHLY posts about new items, volunteer highlights, and play ideas for you and your child. Next time you're at the Orem Public Library, head downstairs and check us out! A Love for the United States! Do you remember the age where you first learned all 50 states of the US. 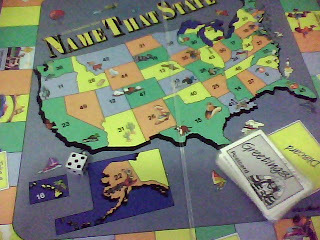 Here is a great game for remembering the States in the USA. The game is called "NAME THAT STATE." The object of this game is to do exactly as it says, Name That State! You will need 2-4 players ages 8 & up. It will be challenging for some or a breeze for others. You will spin the arrow to find which numbered state you will have to name. If correct you will be able to move forward. If you do not know the answer you miss your turn. The game may be made more challenging by having players answer the state and its capital. The first player to make it all the way around the board wins! There are Post Cards with directions-- A postcard may say this: "We enjoyed the view from Mt. Washington in State 6-- 'Name That State.' " And road directions that will move you forward or backwards. This is a fun game that will get you thinking about the states, capitals, and remembering their shapes. This game may be a useful tool in the classroom setting-- where children can test their knowledge, play, and recall what they have learned. If used in a family setting-- be cautious of parents or friends that tend to cheat. But, Worry Not, there is an 'answer key' to guide all players. This game is available for you. Come in and check it out!